Ronnie Spector turns 71 years old today. Along with her sister Estelle and cousin Nedra, Ronnie, then Veronica “Ronnie” Bennett, formed The Ronettes, one of the classic girl groups of the sixties. The trio was signed to Colpix Records, but none of their singles performed well. Then they met Phil Spector, who signed them to his label, Philles. The first track Spector recorded with the trio was “Why Don’t They Let Us Fall in Love?,” which, though the girls liked it, Spector held from release. With Jeff Barry and Ellie Greenwich, Phil Spector wrote “Be My Baby,” with the intention of having Ronnie Bennett, the woman he wanted to be his baby, record it. The resulting record had a classic Spector wall of sound production and Phil recorded more than 40 takes. It took Ronnie three days to get the lead vocal down. 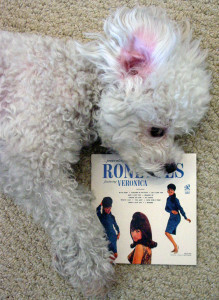 The other Ronettes don’t sing on “Be My Baby.” Background vocals were provided by Darlene Love, Nino Tempo, Sonny Bono, who did promotion for Phil Spector, and Bono’s girlfriend, Cher. Ronnie Bennett married Phil Spector in 1968. They divorced in 1974. Today’s playlist consists of twenty tracks embodying the classic girl groups sound, with an emphasis on The Ronettes.